What better disguise for a secret agent than that of a courtesan? Lily Dawson, dubbed the Countess of Charm, is a spy working for the Crown to uncover a traitor. Andrew Booth-Payne, Earl of Darlington, wants to hate Lily for taking up with his father, but something about Lily intrigues him. 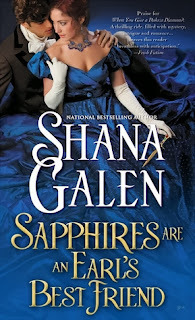 Shana Galen is the author of numerous fast-paced adventurous Regency historical romances, including the Rita-nominated Blackthorne’s Bride. Her books have been sold worldwide, including Japan, Brazil, Russia, Spain, Turkey, and the Netherlands, and have been featured in the Rhapsody and Doubleday Book Clubs. A former English teacher in Houston’s inner city, Shana now writes full time. She’s a wife, a mother, and an expert multi-tasker. She loves to hear from readers: visit her website at www.shanagalen.com or see what she’s up to daily on Facebook and twitter. Love Shana's stories - this one sounds great too! I love the summary because it has intrigue, mystery, spies, and a possible traitor! Love this series. Sad that it's ending though. I love Shana's books and I'm sooo excited for this book :) Thanks for sharing! I am a big fan of Historical Romance. Throw in a mystery and you have the makings of a great book. Love romance with plenty of intrigue, thanks. I like the fact that Lily is a secret agent. How cool! I love historical romance books with spies :) Thank you for the giveaway! Secret agent & courtesan in the same sentence. Got to love that. LOVE me some historical romance! The fact that Lily is a spy. Intrigue and secret agents, can't wait to find out what happens! A historical romance with intrigue and suspense, what's not to love!! I love the Jewels of the Ton series! Shana writes fantastic books! !